ST. PAUL, Minn. - The Minnesota Wild acquired goalie Devan Dubnyk from the Arizona Coyotes on Wednesday for a third-round draft pick. The Wild are 12th in the Western Conference, ahead of only Arizona and Edmonton. They have lost six straight and 12 of 14 and are 29th in the 30-team NHL with an .889 save percentage. Niklas Backstrom started Tuesday night in a 7-1 loss at Pittsburgh and John Curry took over midway through the third period. Darcy Kuemper is out with a lower-body injury. The 28-year-old Dubnyk was 9-5-2 with a 2.72 goals-against average and .916 save percentage in 19 games this season for the Coyotes, his first with the team. 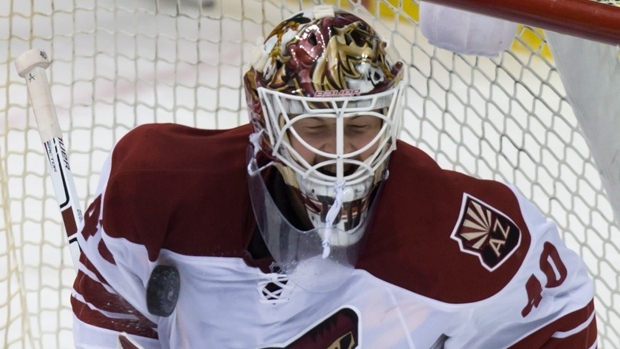 He made 22 saves Wednesday night in Arizona's 3-2 home loss to San Jose. Dubnyk split last season with Edmonton and Nashville and also played for Hamilton in the AHL. He's 70-84-22 with a 2.88 GAA in 192 career NHL games with Edmonton, Nashville and Arizona.